Between 1942 and 1946, the Linde Air Products Division of the Union Carbide Corporation operated two facilities in upstate New York for the Manhattan Engineer District (MED). The two sites—Chandler Street, located in Buffalo, and a former ceramics plant in Tonawanda—were converted to process uranium-235, and produce nickel for the development of the gaseous diffusion barrier for the K-25 Plant at Oak Ridge, Tennessee. At the ceramics plant in Tonawanda, the MED constructed five additional buildings to refine uranium imported from the Belgian Congo and the Colorado Plateau into black oxide. The process produced around 8,000 tons of leftover sludge known as tailings. The additional liquid waste was drained into onsite wells and Tonawanda’s public sewage system, where it flowed into the Niagara River. In 1943, MED leased the 10-acre Haist property for disposal of tailings from the former ceramics plant. According to a 1991 report by the Department of Energy (DOE), around “16 million pounds of residues containing approximately 0.54 percent uranium” were dumped over two-thirds of the Haist property between 1943 and 1946. The MED officially purchased the land in 1944 and the property was controlled by its successor organization, the Atomic Energy Commission (AEC) until 1949, when it was passed on to the General Services Administration. Despite radioactive uranium residues still concentrated in the soil, the Haist property was cleared for sale in 1960 and auctioned off to Ashland Oil Company to use as a tank farm. When the company renovated the site in the 1970s, 6,000 cubic feet of contaminated earth was transferred to the Seaway Landfill, located near residential neighborhoods and an industrial park. 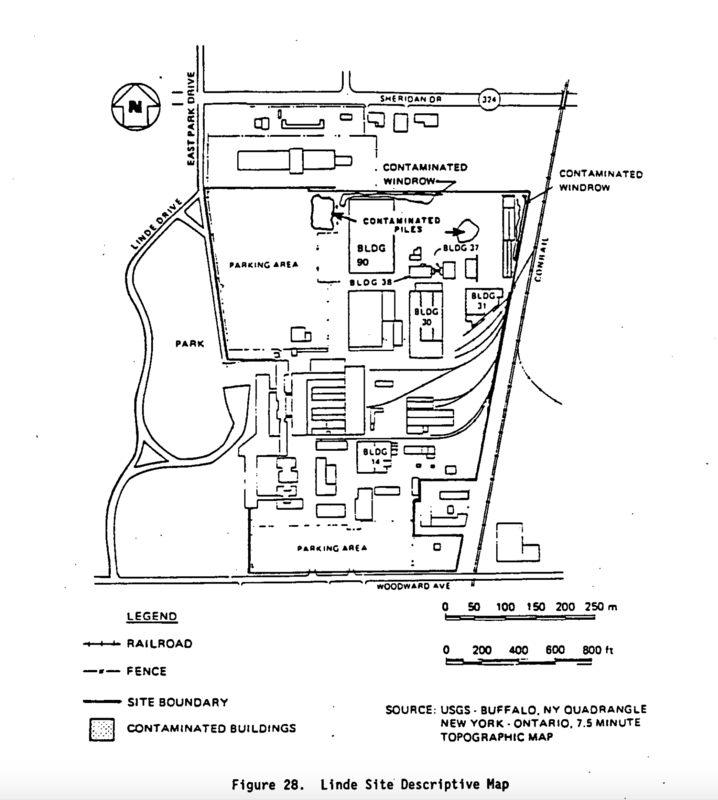 Since the 1950s, several environmental surveys conducted by the AEC, Oak Ridge National Laboratory, and later the DOE revealed elevated levels of radiation at the Haist and ceramics plant sites, now referred to as Ashland Oil #1 and #2. The sites were authorized for cleanup under the Formerly Utilized Sites Remedial Action Program (FUSRAP) in 1984, after DOE found traces of uranium-238, radium-226, thorium-230, and their decay materials in the surrounding area. The remediation extended to Rattlesnake Creek in 2004, where runoff from Ashland #1 and #2 had seeped into the streambeds. In October 2006, the U.S. Army Corps of Engineers issued a final report announcing that the Ashland sites had been successfully decontaminated, but their claim is disputed by residents in Niagara and Erie Counties. Communities have reported an increase in cases of cancer due to the proximity of the Seaway Landfill and traces of uranium found leaching into the groundwater. Community members have demanded the sites be further remediated, but were denied by the federal government on the grounds that radiation levels were too low to qualify for the Superfund program. The Environmental Protection Agency is conducting an investigation to examine the affected areas.